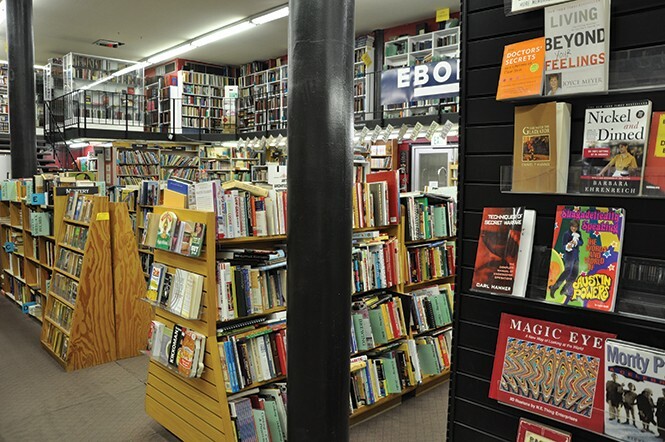 Choose your own adventure at these downtown bookstores. Despite digital alternatives, the old-fashioned book hasn't yet gone out of style. Neither have a few of the bookstores that sell them, even when those wares have been appreciated by others before ending up on their shelves. Four used bookstores—all stocking the new and the rare as well—can be found in downtown Salt Lake City. Each is unique in its selections, making them interesting enough to spend hours wandering their spaces. As far as organization goes, Weller Book Works (607 Trolley Square, 801-328-2586, WellerBookWorks.com) has it down. Everything has a place and, even better, those places will make sense to the average customer. Initially called Zions Bookstore when Gustav Weller first opened it in 1929, the place has retained its family ties. "[Gustav Weller] was my husband's grandfather," says Katherine Weller, a book-buyer at the store and wife of Tony Weller, the store's current owner. "So it went from Gus Weller, to Sam Weller, to Tony Weller. And we are still family owned and operated, so this is a three-generation family business," she continues. "We aim to provide a variety of books for a variety of readers." Though titles here range anywhere from brand-new to decades-old, the overall vibe is bright and shiny. Perhaps as a result, most selections cost about what they would at a mainstream chain store. However, there are a few collections placed outside the first floor doors that are significantly discounted, some priced at $1 each. You'll know Utah Book & Magazine (327 S. Main, 801-359-4391) by the slightly creepy (especially until you realize it's not human) figurine just outside the entrance, surrounded by VHS movies for sale. Inside the cluttered opening, you're drawn down a long, narrow passageway with occasional offshoots and an ever-looming stack of items—mostly publications—surrounding you on all sides. The emphasis here is definitely old: Old chairs sit above possibly older books near the likely even-older magazines. Given its legacy, this shouldn't be surprising. "Been in business 100 years—[since] 1916, when my grandfather started all of this," Peter Marshall, the store's current owner, says. "I've been doing this since I was about 8, I'm about 60 years old, if that tells you anything," he says. His grandfather's store was called Utah Coin & Antique, and was located on 100 South and State. Today, Utah Book & Magazine offers a significant selection, and the surroundings lean toward a pleasantly spooky atmosphere. Vast, a little wild and amazingly extensive, Eborn Books (254 S. Main, 801-359-0460, EbornBooks.com)—occupying the space that was previously home to Sam Weller Books—is nothing if not an adventure. "We're in our 27th year, but we've only been in this location for just over four years," Bret Eborn, the store's founder and owner, says. "When [Weller] moved out, we had six small stores from Ogden to Provo." Four of those six were combined to make the Eborn Books near Gallivan Plaza, but, Eborn says, "Now we're back to four stores again anyway ... but this is the big one." Eborn's extensive collection is separated into categories: Western, religious, local, novels, etc. Within those sections, the books are not organized alphabetically, or by any other easily identifiable system. However, what Eborn Books does have, that many other bookstores do not, is a complete online inventory from which you can order specific titles. While it takes a lot of work to maintain the shop's inventory, Eborn says it's worth the effort, since "probably half of our sales are online." Plus, "We put them on there so we know we have them," he adds. Paperbacks and hardbacks range in price, depending on their condition and style, and come in nearly every genre. "We buy and sell everything," Eborn says. "That's how we take care of our customers." Volumes of all sorts greet customers through the windows from racks on the east wall of Ken Sanders Rare Books (268 S. 200 East, 801-521-3819, KenSandersBooks.com) before its doors are even opened, hinting at the collections within. The store itself, while relatively small, contains a unique filing system. "We have sections here you wouldn't find in an ordinary bookstore," owner Ken Sanders says. Take the "It Can't Happen Here" display, containing multiple dystopian novels, a few books on Nazism and some on what it means to be evil. Though no proper name is featured at the top of this display, the image of a red baseball cap should make it clear which public figure this area is referring to. Sanders has owned this store since he opened it with his daughter, Melissa, in 1997. "The Ivory Company owns this whole corner now. It's not much time before it comes down and they put up a high-rise," Sanders says of the current location. "I've successfully signed a three-year lease ... but in two and a half years, I don't have any idea what we're going to do." Generally, prices are reasonable, and most volumes are impressively inexpensive. The 10,000 paperbacks lining the outer walls are priced $3-$10—easily affordable by the college students and teens who find their way in.